If you think Switzerland, your first though might be snow, mountains and beautiful landscapes. This is exactly what you get, when you play on the “Gurten”, where the Swiss Disc Golf Championships have been held this year. Situated at 864 meters above sea level and 332 meters above the city of Bern (Swiss capital), the “Gurten” offers a fantastic panoramic view over Switzerland’s capital with its UNESCO protected domes, towers, and roofs overlooking the Swiss plateau with its charming villages, well-kept fields and forests aplenty. The Swiss Alps' peaks rise over 4000 meters, are capped with eternal snow and sprawl across the Three Lakes Region all the way to the Jura mountain range. Facilities on the “Gurten” include a hotel, restaurants, a viewing tower, a children's playground and finally a permanent disc golf course. No cars are permitted on Bern’s local mountain, but it is easily accessible by taking the red “Gurten Funicular”. Built in 1899, this was once the fastest railway of its kind in Switzerland, and it has transported over 30 million passengers to date. Since 1999, new panoramic carriages have been in operation between the valley station and “Gurten-Kulm” at the top. The local disc golf club “Walkabout” has hosted several events in the past years on the “Gurten”, including the Swiss Open, the Spring Clang, the Golden Leaf as well as the Bern Open, which was the PDGA Eurotour Final in 2009. In fall, the course was extended with extra holes through some adjacent farmland to offer a challenging par 56 course to the players. As in previous years, this also included the world famous 265 meter long “Voguloch” (birds nest), all downhill over a valley to a relatively small and all green platform. Course ready, weather great – let’s play! In most of the divisions the favorites defended their Swiss champion title, except in the Master and Junior divisions, where new champions have been crowned. Stephan Müller, having won his first European Champion title (Master) at Colchester, England this year, has dominated the Swiss Disc Golf scene for many years. This was not different at the Bern Open and Swiss Championships 2012, where he played in the Open division. Having shot high ratings in all rounds, including the course record of 47 in rounds two and three, he was untouchable for his competitors. At the end, he won the tournament and his almost uncountable Swiss Champion title with 28 under Par. As there have been a separate ranking for the Bern Open and the Swiss Championships, the second place was awarded to Tony Ferro, who just recently returned from the States to live in Switzerland again, but the Silver medal of the Swiss Championships gone to Martin Jenny, who placed third in the Bern Open ranking. Bronze medal was awarded to Lukas Schär. In the Master division, Christof Schlegel won his first Swiss Champion title, while Paul Francz dominated the Grandmaster division again and won his 10th consecutive Swiss Champion title with a lead of 40 strokes. Senior Grandmaster Franco Puliafito also was never in danger of losing his title. As it was with the Women, where Natalie Holloköi won her 5th title in total. Nicolas Kaeser from Geneva was awarded the gold medal in the Junior’s division. 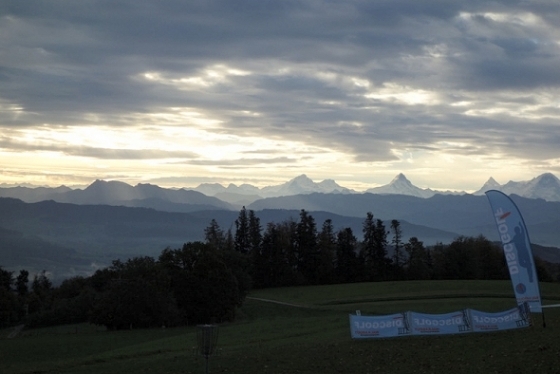 Even though new players are joining the small Swiss Disc Golf scene frequently, almost the same players dominate the scene year after year. Talent, excellent technique, continuous training and physical fitness are the main reasons for their long-time personal success. On the other hand, the scene still needs further growth, which is one of the priority goals of all our clubs and the Swiss Disc Golf Association. Special support and new possibilities may arise if and when the national disc sports association receives member status of the national sport association “Swiss Olympic”. The membership application will be handled at their Annual Congress, which will take place on the 18th of November. Being a member of “Swiss Olympic” will provide an “official sport status” to Disc Golf and all other disc sports and will open some new doors (media, press-channels, school-sport, financial grants, etc.). We will report on the outcome. Well, a great disc golf weekend was had on the “Gurten mountain” in Bern again and we hope that more international participation, especially from our neighbor countries, can be generated again in the future. 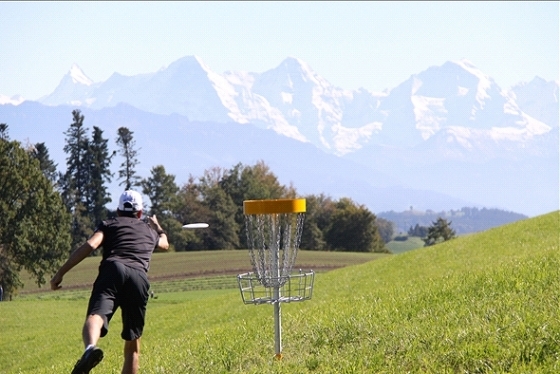 However, a trip to Switzerland is worth it at any time, to play disc golf, or just to visit the many beautiful spots. See more photos of the Swiss Open!